It’s just about shopping season! Last year, 19.2% of all retail sales were holiday sales – the stuff outside of food, gasoline, and other consumables that took place in the 28 days between Thanksgiving and Christmas. That’s a total of $597B. 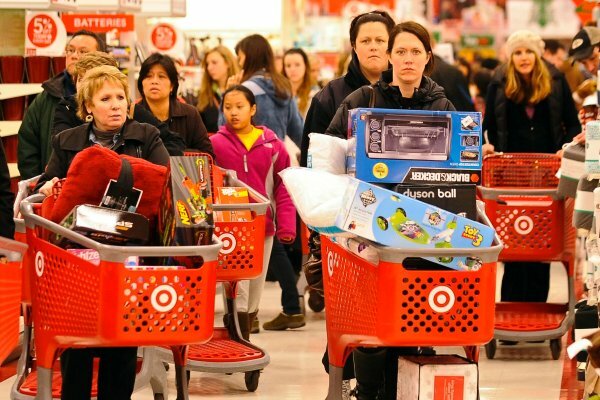 This year, there’s one more day in that period and retailers hope for a decent increase. 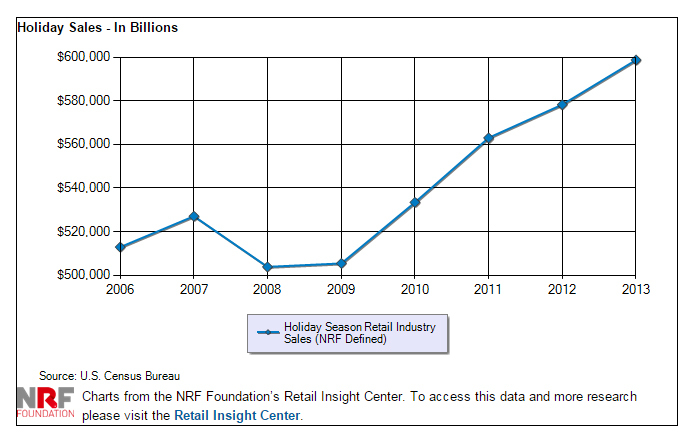 Will this be a good holiday season that finally shakes off the blues that have plagued retail for the last six years? We’re about to find out. Last year’s holiday sales only grew at 3.1% over 2012, which as a bit of a disappointment. The projections were all over the map, ranging from 2.4% to 4.5%, with a rough average of 3.6%. Not in 2014. Everyone is focused on the 4.1% target provided by the National Retail Federation (NRF), or $617B total. Online sales are projected to keep growing at about 8-11%, about what they did last year, to about 44% of all shopping for the season. This is an important time for many reasons, not just the income for retailers. The mood set at Christmas is often an indicator for the coming year, or at least the start of it. We call major economic downturns “Depressions” for a reason – there is a psychological component to the whole thing as negative impressions feed on each other. A year with relatively good news seems to be just what retailers have been hoping for. While not completely throwing caution to the wind, Americans’ frugal spending habits will still be visible this holiday season as they continue to rely on discounts and sales and comparison shop. It’s growing faster, it’s sexier, but people really are just guessing. It will still be all about the value, which might explain the amount of online shopping. Price comparisons are much easier on the ‘net and the best bargain may well be what wins. Black Friday may well be back, at least according to Accenture. Their survey showed that 66% of all shoppers plan to shop on Black Friday, up from 55% last year. This includes 45% of all shoppers who plan to do at least some shopping on Thanksgiving, up from 38% last year. But this survey didn’t tease out how many will be shopping online from home, so there is still hope for Thanksgiving after all. 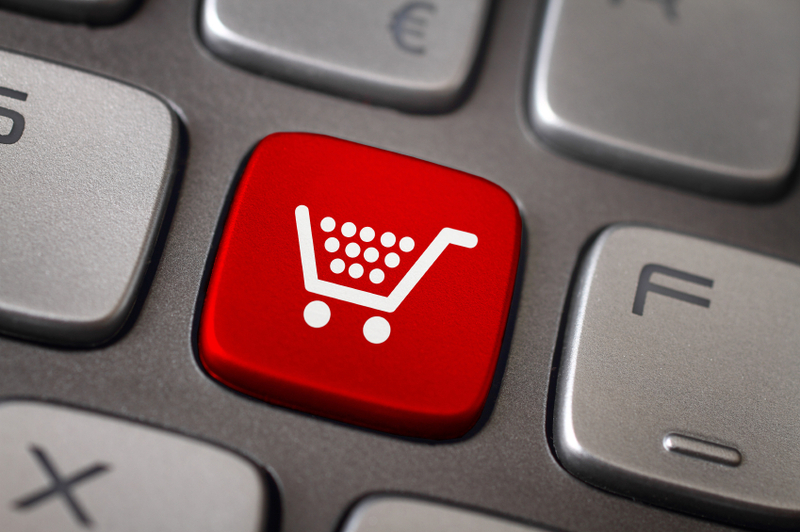 The Accenture survey contains a tremendous amount of data on shoppers habits. For example, 71% plan to do some “webrooming”, or browsing online before going to a physical store to make their purchase. 68% see themselves “showrooming”, or looking over products in a physical store before purchasing at the best price they can find online. The overlap shows that shoppers have many different strategies that overlap, possibly in unpredictable ways. 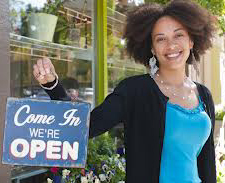 This may be where small retailers have an advantage over large ones. A small retailer that can be more flexible on price, even haggling, may be able to capture a sale with these customers who are clearly doing their homework before buying. As online shopping creeps towards half of all holiday shopping, it’s clear that information is the key to a a successful season for both buyers and sellers. How will this play out beyond the shopping season? Growth rates as high as predicted will spawn tremendous optimism going into 2015 and may be what we need to push the slow restructuring out of this Depression into a higher gear. It’s worth noting that no one is talking about credit card security issues of the kind that played havoc with Target last year. That is the only known potential variable that could derail the prediction of over 4% growth. Retailers are looking forward to a solid holiday shopping season in 2014, and there is little controversy between those who make the calls. We’ll see by mid December if it’s going well, and that may make it easier to make some solid calls on how 2015 will start. This entry was posted in Money, Nooze and tagged black friday, Economics, economy, Holiday Shopping, retail, turnaround. Bookmark the permalink. “shopping” may be “good for the economy, but almost every individual would be better off saving her money instead. So what is (supposedly) good collectively is harmful individually (who amongst us really needs more stuff???) and I don’t see this much discussed. This is entirely true. But one of the big problems in this so-called “recovery” period has been the very low velocity, or turnover, of money. That really does have to change before we will get out of the problems. If savings were put into the kind of loans that Credit Unions make things might improve, too. That is what we hope! Holiday shopping just depresses me. The whole comparing online and seeing in the store is so much work & I don’t know why people do all that. Buy from local artists! Get unique presents for your friends and family! That is a very good idea! Has the same effect, but keeps it local. I agree that a good Christmas would put everyone in a much better mood. If only there isn’t a government shutdown again this year. Yes, the government shutdown is blamed on the weak holiday shopping last year. 2014 was not a good turnaround year, so something has to happen to make 2015 start out well. More seriously Jack Lew has said that the economies of Japan and Europe are flat. Hence slower world economic growth. Russia I think projects zero growth. Russia will be lucky to have zero growth. We are indeed the only strong engine in the world right now, and our turnaround is going to benefit everyone. Abenomics has failed, and it may yet fail spectacularly.